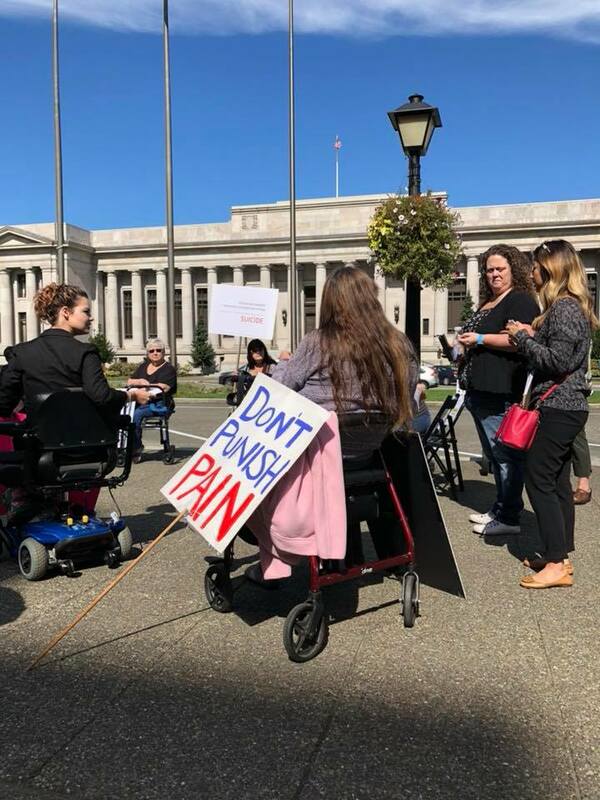 Hundreds of people – including some in wheelchairs and others on crutches – took part in a nationwide series of rallies Tuesday protesting the poor treatment of chronic pain patients. “Don’t Punish Pain” rallies were held in over 80 cities from Anchorage, Alaska to Jacksonville, Florida. The protests were organized on Facebook by a grassroots group of pain patients, including many who have lost access to opioid medication or seen their doses drastically reduced due to federal and state guidelines that target opioid prescribing. Rally organizers were disappointed by the low turnout in some cities. Only a handful of people showed up for rallies in Las Vegas and Providence, Rhode Island. But over a hundred patients and their supporters rallied in Oklahoma City. And about two dozen people rallied on the steps of the state capitol in Olympia, Washington. Due to their small size, the rallies have yet to attract the national media attention that organizers are hoping for. But they have been successful in drawing local media coverage and getting reporters to tell a side of the “opioid crisis” that’s rarely addressed. Ben Lawrence has lived with chronic pain since an accident in 2009. He told CBS4 he was still able to work until his doctors stopped giving him opioids. Rally organizers in Stuart, Florida told ABC25 News that patients are being unfairly targeted in the opioid crisis when the real problem is illicit drugs. "They are calling this an opioid crisis when actually it's a fentanyl crisis, and they can't control the drugs coming into the United States. But they can control people like us who get our pain medication to survive," said Michael Courtright. Patients are calling for major changes in guidelines released by the CDC in 2016, which discourage doctors from prescribing opioids for chronic pain. Although voluntary and only intended for primary care physicians, the guidelines have been widely adopted as mandatory by insurers, regulators and healthcare providers. “Chronic pain patients all across the country are losing access to their pain medications that they depended on sometimes for 20 or 30 years,” Kristen Blanton told Fox55 News in Urbana, Illinois. Don’t Punish Pain organizers held their first nationwide rallies in April and are planning another series of protests in January.